Baharash Architecture practice has unveiled its design for the world’s greenest eco resort located in the UAE. Situated in Liwa, the UAE’s southern region, the resort is one of several the eco company is planning to instigate over the next few years. 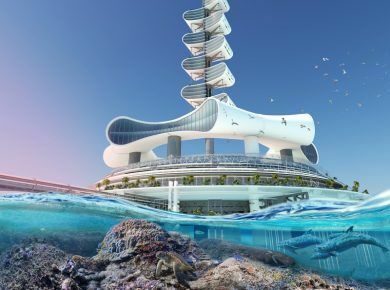 The oasis is set to open its doors in 2020 with a group of entrepreneurs striving to create a green economy. Some 157,000 sq ft of solar panels have been implemented to power the resort with all its energy needs, enveloping it in a star-shaped ribbon of panels. Baharash Bagherian, designer and founder of the London-based practice, commented on the inspiration driving the design where they draw upon the UAE’s roots: “At the very early stages of the project, we found out that we could extract groundwater using a deep well. This gave us an opportunity to create a story around a spring, which was of critical importance to Bedouins for trade and transportation routes.” Once Bagherian realised they could extract water via a deep well, they harnessed these local materials and have used this water source for the resort. Additional eco-friendly measures have been implemented such as waste water treated on site and recycled for irrigation; a zero-emission zone; and on-site waste management. The resort will also employ wildlife biologists and conservation staff. At the centre of the resort is a spring, which acts as a tranquil oasis in the heated climate. Surrounding this is a series of facilities and accommodation including 84 interconnecting suites that vary in design but all allow for views of the spring.